Stress affects each one of us, in one way or another, and learning infallible stress relief techniques can be an invaluable tool. The result being a desire for lifestyle changes, including mindfulness and relaxation, that are among the many reasons why Eastern mind/body/soul practices have become so popular in the Western countries. Thai Massage, or Thai Yoga Massage, is one Asian bodywork therapy that is acclaimed for holding many therapeutic advantages. Although indulging in Thai Massage, and other massage therapies, won’t completely prevent diseases and illnesses, it can calm the body and, therefore, help to minimize cortisol production (the stress hormone) and reduce muscle tension that may result from a “fight or flight” reaction to (real or perceived) threats. What is Thai Massage and How Does it Differ From Other Massage Techniques? Believed to have been founded by Buddha’s own physician approximately 2,500 years ago, Thai Massage (or nuat phaen boran) is one type of ancient therapies that focuses on specially designated energy lines, or meridians, through the body. Practitioners of Asian medicine focus on 12 major meridians, in addition to minor energy pathways and hundreds of pressure points. 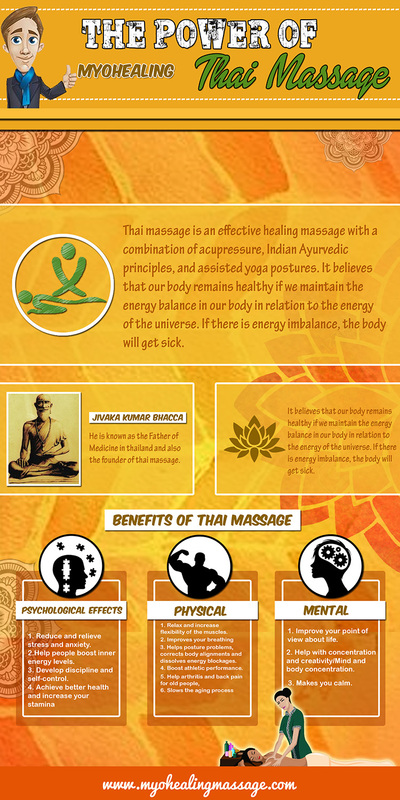 There are a few physical characteristics that Thai Massage and spa massages have in common. The receiver (the person receiving the massage) is advised to wear comfortable, loose-fitting garments that allow movement. The giver, or the massage practitioner, uses his/her hands, feet, arms, legs and torso to pull, press, stretch and rock each section of the receivers body. An easy way to picture a Thai Massage session is by imagining a yoga class where students are assisted by a second person. Each “second person” molds the body that they are working on so each asana is performed properly, without the student’s need for focus or energy expenditure. The slow movement, correct alignments, relaxed state and guided motions help receivers to stretch and tone their muscles without “working for it”. Instead of pushing too hard or worrying about balance, receivers simply enjoy each range of motion. Practitioners should know how to gauge the physical abilities of their receivers. Although Thai Massage usually follows a set series of asanas, pressure points and stretches, practitioners will adjust each movement to match the receivers aptitude and needs. What Can You Expect From Your Thai Massage Experience? The internet is full of claims and “success stories” in support of Thai Massage for reducing anxiety, muscular pain and other health problems. What you can expect to feel, however, is a slow and in-depth assisted stretching routine that lasts between 60 minutes to two hours, depending on the practitioner and facility, or center. Whether this routine is pure bliss or a blissful torture will depend on how in-depth the giver applies each force, and how flexible or tense the receiver is pre-massage. As stated, givers will adjust their routine to the needs of each receiver. In general, receivers experience a range of twists, compressions and pulls while laying on their stomachs, backs and in sitting position. Finger pressure is also applied to a number of spots along the energy meridians, from the feet to the head. Sometimes, if the receiver’s muscles are tight or knotted (perhaps from stress build-up, anxiety, or even work routines that require many hours in a seated position) these stretches and pressure points may feel painful. There is no set routine that practitioners follow, and each will adopt the mechanisms or methods that they feel are most beneficial. Have Any Scientific Studies Proven That Thai Massage is Beneficial to a Receiver’s Health? To date, little research has been conducted in support for or against massage therapies for holistic health. Still, some positivity has been noted. Traditional Thai Massage techniques seemed to help reduce anxiety and conduct problems. Patients with back pain may also benefit from routine Thai massage sessions, in addition to regular deep tissue treatments. Who Should Not Practice Thai Massage? With so many endorsements, it seems like anyone would benefit from this ancient healing system. On the contrary, a few groups should steer clear from Thai massage entirely, or consult a doctor before seeking out a practitioner. First, givers place themselves at risk of contracting an infectious disease while using their bodies to move the receiver into each position. Second, friction caused by rocking or pulling may irritate some wounds or rashes. Even though asanas are passive, they may still lead to an accelerated heart rate, constricted blood vessels and high blood pressure. Each of these states can hurt the healing process of patients. In each of these cases, side effects may increase with the incorporation of bodywork. How Should You Prepare for Your Thai Yoga Massage Session? Many receivers dress in loosely-fitted, pajama-style clothing for their massage, but fitness clothing is perfectly suitable as well. As long as garments are not restrictive for movement, they are fine. If you don’t practice yoga regularly, trying attending a couple of classes before the scheduled date to get an idea for how stretches feel. Participating in yoga regularly will also prepare the body for the passive asana-like stretches and pulls during the massage. Do your research before the massage date. If a pre-existing condition does exist, ask your doctor for a list of movements that may or may not influence the impact of the massage. Also, tell your practitioner of the condition in advance so he or she can adjust the routine to meet your needs. And don’t forget to relax. Tense muscles can lead to pain or injury, and breathing deep may help calm yourself and loosen the body. In a world where stress affects so many of us, it is important to participate in therapeutic activities that can ease our minds, while relaxing our bodies. Thai Yoga Massage is one practice, which dates back to the days of Buddha, that may offer many benefits. Unlike other massage sessions, Thai Massage is more of an assisted yoga session mixed with acupressure. During each massage, limbs are pulled and twisted, pressure points are pressed and the body is rocked, so the receiver experiences a wide range of motions. Whether the massage is painful or not will depend on the tightness of the receiver’s muscles, and seasoned yogi’s will feel more relaxed during a massage than a novice to Asian bodywork. It is generally healthy, but a number of individuals should think twice or consult a doctor before participating in this (and other) massage therapies. Anyone with infectious diseases should refrain entirely from this activity (so the giver or practitioner is not placed at risk). For the most part, Thai Massage is a stress-reducing activity that is known for raising a receiver’s mood, energizing the body and improving flexibility.